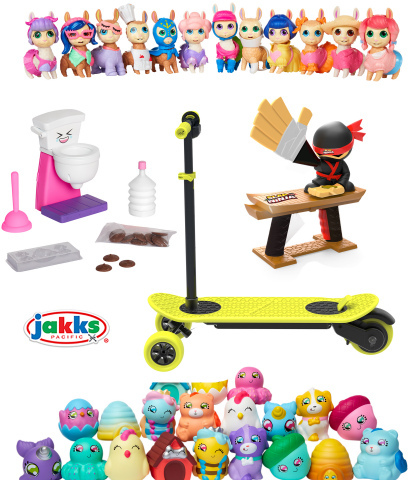 One of the leading designers and marketers of children's toys and consumer products, JAKKS Pacific, Inc. (NASDAQ:JAKK) will showcase new and innovative products and exciting new entertainment properties at this year's Toy Fair in New York City February 16-19, 2019. From active play to collectibles and games to hot entertainment properties, JAKKS has the perfect toy for any age. Brands such as MorfBoard™ and TP Blaster™ provide hours of active play and extreme fun year round, while the new line Piñata Fiesta™ brings the classic surprise delivery system of piñatas into a festive collectible and activity toy line. Finally, fans of all ages will love new product lines of interactive and highly detailed figures, plush, and playsets from entertainment-licensed properties such as Becca's Bunch, Gigantosaurus™, Godzilla, Harry Potter, and Mega Man, to name a few. "We are entering 2019 with an impressive line of fun and entertaining toys," said Stephen Berman, Chairman and CEO, JAKKS Pacific. "We are thrilled to launch line extensions to last year's runaway hits, MorfBoard and TP Blaster, as well as launching licensed-products inspired by some of the most anticipated entertainment properties this year," continued Berman. For Active Play: Kids will love playing with toys that encourage them get up and move for hours of extreme and active fun. MorfBoard™ E-Scoot is the latest Xtension to MorfBoard's high-performance deck and component system. Kids over the age of eight will zip around town at speeds up to 10 MPH. MorfBoard E-Scoot will be available at all major retailers for $249.99. Collectible Favorites: From squishy toys to llamas with a little drama, kids will love to grow their favorite collections with this year's irresistible lineup. Piñata Fiesta™ brings the classic surprise delivery system of piñatas into a festive collectible and activity toy line. Surprises inside include adorable, party-themed charms, bracelets, rings, and festive confetti! New surprises will appear in every series and scale. There's a party in every piñata for kids ages four and older starting at $7.99. Who's Your Llama™ is a line of collectible llamas bursting with personality! These are the silliest llamas you'll ever meet! From Bahama Llama to Drama Llama, each one comes dressed in a cute outfit and includes 1 of 4 super silly features: winking, spitting, grinning, or sticking its tongue out. Who's Your Llama™ is a fun surprise for kids ages four and older for a recommended retail price of $6.99. Hot Entertainment-Licensed Properties: With this year's wide range of entertainment-inspired products featuring premier licensed properties, JAKKS has something for every fan, both big and small. With the Mega™ Buster Arm Cannon, the iconic feature that stores the powerful schematics of our robotic hero, kids can pretend to be Mega Man. The Mega Buster Arm Cannon features lights and authentic sounds from the all-new TV-show when the trigger is squeezed. The arm cannon will be available for $24.99 and is recommended for kids ages three and older. Gigantosaurus™ Feature Giganto allows kids to bring Giganto to life. Featured in Gigantosaurus™, an animated series for preschoolers, Gigantosaurus is the biggest dinosaur in the land and four little dinosaurs are in total awe. Mazu, Rocky, Tiny, and Bill are exploring their prehistoric world while conquering fear, enjoying friendship, and having tons of fun and adventure! Children can even make Giganto stomp and roar like he does in the show! Gigantosaurus Feature Giganto is ideal for children ages three and older for a suggested retail price of $29.99. Becca's Bunch™ is a new preschool program for children ages 3 to 6 years old. The show merges live-action footage, puppetry, 2D, and CG animation to create a textured world that the audience will want to reach out and touch. In Wagtail Woods, a little bird named Becca and her Bunch of friends – Russell, Sylvia, and Pedro – are always ready for action! With the Becca Feature Plush, kids will love hearing Becca's iconic phrases and theme song and cuddle with her too! The Becca Feature Plush is perfect for kids ages three and older and will be available at a suggested retail price of $19.99. The Sonic the Hedgehog Pinball Track Set brings the iconic video game to life with its customizable track. Fans simply pull the pinball launcher and shoot the Sonic spheres through the loops and turns. The set comes with an exclusive Sonic sphere and removable figure. The Pinball Track Set is perfect for Sonic fans ages three and older and will be available at a suggested retail price of $24.99. The 24-inch Godzilla Figure is the ultimate gift for Godzilla fans. Standing at 24-inches tall and over 36-inches long, this figure is fully poseable with articulation in the jaw, neck, shoulders, hands, legs, feet, and tail. Its massive scale and incredible details will bring Godzilla to life for fans ages three and older and will be available at a recommended retail price of $59.99. Harry Potter™ fans can now play with their own interactive Hedwig™. The Hedwig™ Interactive Creature responds to sounds by turning her head and makes 12 unique owl sounds. Hedwig™ will be available for a suggested retail price of $19.99 for fans ages four years and older. Activities, Interactive Play, and Games: JAKKS brings suspense, thrills, and laughter with its lineup of hot new activities, interactive play, and games. These items are sure to provide hours of hilarious and entertaining play. Kids will have tons of giggles and laughs with the Chocolate Poop Maker™. The Chocolate Poop Maker™ replicates a realistic toilet bowl that makes adorable and yummy chocolate poops! Kids can make their own adorable chocolate poops by melting the chocolate, "flushing" it down the toilet, pouring the chocolate into the molds, refrigerating for five minutes, and adding their own cute poo-tastic touches! The Chocolate Poop Maker™ will be available at retail for $9.99 for kids over the age of six. Slap Ninja™ is the new, fast paced game of reflexes. Play as the Ninja Master and use his HUGE Karate Chop SLAP to defend his precious coin from his Student. Or, play as the Student trying to tap the coin in the Ninja's hand to defeat him. The first player to defeat their opponent three times is the winner, and the loser gets ZAPPED! It takes seconds to learn, but a lifetime to master! Slap Ninja™ will be available at retail for a suggested price of $19.99 for kids ages six and older. Toilet Paper Blasters™ Sheet Storm™ transforms toilet paper into clean spitballs. It features rapid-fire pump action to blast spitballs up to 50 feet! One roll of toilet paper makes 350+ spitballs for non-stop blasting action! Kids over the age of eight can wipe out the competition for $39.99. Vehicles: This year, JAKKS expands its exciting portfolio of toys with wheels. All season, all terrain, all power, it's the new X-Power Dozer™! Push and pull up to 200 lbs indoors or outdoors. The X-Power Dozer™ can plow through rocks, dirt, wood, snow, toys, and just about anything thrown in front of it! The X-Power Dozer™ will be available at retail for $59.99 for kids over the age of six. JAKKS Pacific, Inc. (NASDAQ:JAKK) is a leading designer, manufacturer and marketer of toys and consumer products sold throughout the world, with its headquarters in Santa Monica, California. JAKKS Pacific's popular proprietary brands include Perfectly Cute™, Squish-Dee-Lish™, Disguise®, Moose Mountain®, Funnoodle®, Maui®, Kids Only!®; a wide range of entertainment-inspired products featuring premier licensed properties; and C'est Moi™, a youth skincare and make-up brand. Through JAKKS Cares, the company's commitment to philanthropy, JAKKS is helping to make a positive impact on the lives of children. Visit us at www.jakks.com and follow us on Instagram (@jakkstoys), Twitter (@jakkstoys) and Facebook (JAKKS Pacific).